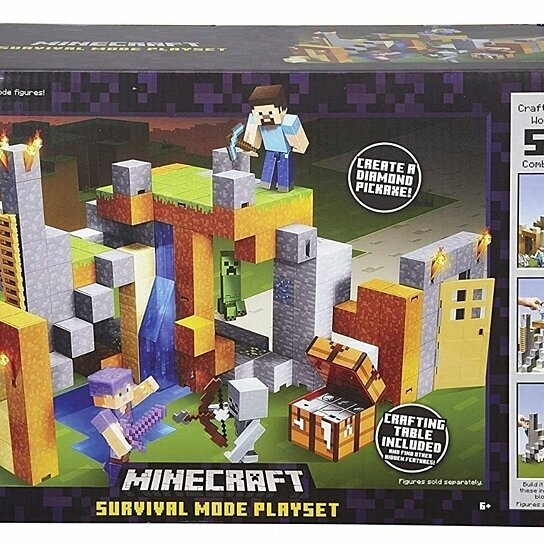 The Mattel Minecraft Survival Mode Playset. Model: (DMN76). Features: - This Minecraft playset unfolds to feature game authentic biomes on multiple levels with expanding sections, secret passages, and "hidden" surprises. - This playset provides endless customizable configurations. - Features include: a waterfall, numerous removable torches to move around and place throughout the playset, a fully functioning door, usable ladders, adjustable platforms and a transforming Obsidian walkway above flowing lava. - Utilize a working crafting table to create a diamond pick axe. - Lots of surprises including a hidden diamond and zombie character.